When S headed to college I fell out of Sunday mornings pancake making tradition, so when I saw this Red Star Yeast recipe, I was eager to give this yeast version a try and get back on the Sunday morning pancake wagon. This Sunday is Spring like, cheery and sunny, birds are chirping, a perfect bright day to add this yeast pancakes version to my ever growing pancake recipes sash. The first batch I made this Saturday went in a flash, so I only had a chance to snap a couple of photographs, so I made a second batch this Sunday morning to photograph. I can't wait to make it again next week when S is back with his English roommate for Spring break. A yeast surprise twist to keep breakfast and brunch interesting, alternating with my French Crepes and Rolled Oats Pancakes. I hope crumpets and pikelets conversation will ensue again. I am still confused from the last time the fellows were here visiting on Thanksgiving break, captured somewhat in my celeriac mashed potatoes post.You Brits and my friends down under know exactly what I am speaking of! Help! Many of you know of my professional collaboration with Red Star Yeast, this post is part of the Marbled Rye Bread, Cinnamon Buns and Multigrain Oatmeal Bread series. My method is slightly different than Red Star Yeast's directions and I varied the ingredients a tad. Check out the original recipe here. These yeast pancakes are light and fluffy and hold their shape and beautiful volume well after cooking. They were a pure joy with maple syrup but you can make a chocolate sauce or lemon curd to go with them. For variation's sake, you can replace the milk with orange juice and substitute the butter with oil. Work with a small or a medium hand held whisk. In a large bowl combine 1 cup flour, yeast and 1 tablespoon of sugar, whisk well. Heat up milk and water until very warm temperature and add to flour mixture and whisk until all ingredients are well incorporated. Cover with saran wrap and let rise for an hour. In a separate bowl whisk 2 eggs well. Add the butter to the eggs and whisk. In a separate bowl combine the remaining 1 cup flour, 1 tablespoon sugar, baking soda and salt and mix with a heat resistant rubber spatula. (we will need the rubber spatula later again to scrape and scoop the last pancake into the griddle). Heat up a griddle or an iron cast skillet. Once heated pour a few drops oil on the surface. Brush the oil over the skillet or griddle surface. I needed to season the skillet/griddle with oil just once at the beginning. Beat down the yeast mixture and add the egg and butter mixture while keep whisking until incorporated. Add the dry flour mixture in few batches to the yeast mixture and whisk until well incorporated. Scoop a small pancake into the griddle to make sure the griddle is hot enough. If it's not, just wait a tad longer for griddle to heat up. The griddle might be too hot and the pancake might brown too fast without cooking inside. Adjust heat and proceed to scoop a full batch. Scrape the last bit of dough, for the last pancake, left in the bowl with a heat resistant spatula and pour into the the griddle. I found my iron cast skillet needed to be on low/medium heat in order to get the deep golden color and still give the pancake enough time to cook inside. Wow! 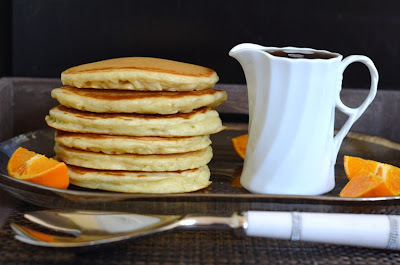 What a delicious batch of pancakes & a great recipe! I must try this one. Your site is looking terrific, Shulie! Thanks for sharing this recipe. All the best! Thanks so much Elizabeth. Super sweet of you to say! Those pancakes look delicious! We had a big lunch yesterday so both my husband and son asked for pancakes for dinner - but they weren't as delicious looking as these! We too love breakfast for dinner at times. It is fun to change things around! TY Rosa. Surprising, isn't it?! You know how much we love pancakes over here. I have been waiting to see your new yeast recipe and can't wait to try this out on the kids. Will make the batter for tomorrow:) They look fantastic! TY Lora. I remember the yeast waffled you made. I am yet to explore waffles, I misplaced the waffle press. Hm I've never heard of yeasted pancakes, but it sounds really intriguing. I know, right?! Were my sentiments exactly when I saw the recipe. Terra, you are the sweetest. I am so tickled about how joyful you and happy you are that you won the Red Star Giveaway. Couldn't go to a better person. Yum! I am going to try this. Oooh let me know if you do! Yeast pancakes!...want to make it soon, the stack looks yummity, yum..And love the makeover of yoru site, Shulie..coming here after a log break.. Hugs. My hubby has the weekend pancake duty, but I may have to kick him out of the kitchen to try these winners....I have a feeling they're a heck of a lot tastier than Bisquick :/ Thanks, Shulie! I have to make these! They look delicious and we all love pancakes at my house. You know what? I've never ever made yeast pancakes. Why? I have no clue, cause they look amazing! Yeast pancakes? That sounds incredible! I bet the flavour is just gorgeous! Beautiful site, might I add! I've only just seen yeast recipes for the first time recently but what a great idea. Yours look simply amazing!! I have never come across a pancake recipe with yeast..I need to try it they look so light and fluffy!!! These look so fluffy and delicious. Love it. I actually have never made yeast pancakes but I think its time I tried it soon. How could i have missed this!?!?! Such wonderfully fluffy pancakes are what Sundays are all about. Beautiful Shulie! Wow I've never thought of putting yeast in pancakes ~ but these look wonderful! Thanks for sharing! Congratulations for being Top 9! Pancakes...who in the world doesn't like pancakes? I love hearing that your son and his college roommate are coming home and your pancake weekends can resume! They sure look delicious. chefyoga how much baking soda ??? This gets noted down/bookmarked!I have never had Yeast Pancakes,so I must try some day! A nice looking stack of pancakes! I like your idea of serving them with lemon curd. In our family the girls are the pancake queens and are always on the lookout for something a bit different. Thank you for a new weekend recipe! These look like million dollar pancakes! Perfectly fluffy... just the way I like 'em! Yeast pancakes!! now this is something I would love to try! a large pancake sunday breakfast is bliss. Mmmm... these look fabulous! I just finished up my maple syrup this weekend with some waffles, but now I've got plenty of reason to go get more - these pancakes! I made these yesterday and you are our hero! Most delighted with the results, my friend said. I couldn't agree more. There wasn't one left over. These pancakes look wonderful... Definitely a recipe I need to try! TY so much Drea. Lovely lovely tweaks and pancakes. Only 15 sounds good to me! cuts back on the souring of the pancakes! My dear, these look lovely. I can see why the obsession continues. I can't wait to try making pancakes with yeast!